We are very proud to receive a 5-Star rating from Medicare (Nursing Home Compare) in all four areas evaluated, as well as a zero deficiency survey conducted by the California Department of Public Health. 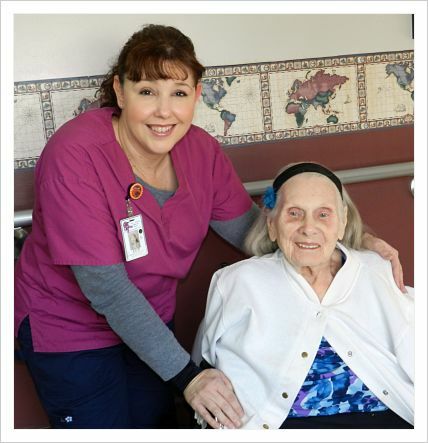 Especially gratifying was the surveyors comment saying, "Your facility isn't new and modern, yet no one can rival the level of quality care you provide to your residents, especially the personal care and attention you give them." We have top quality staff who are dedicated to providing care that helps the residents achieve an optimal level of health and an optimal quality of life. With 16-skilled nursing beds and 8-swing beds (long or short term skilled care) we care for up to 24 residents, and there is always a waiting list. As a distinct part of a hospital a physician is available 24 hours a day. Each resident has an individualized care plan based on their diagnosis and unique needs. Their care team includes a physician, a registered dietician to provide an individualized therapeutic diet, physical and speech therapists (as needed), an activity director, a social services aide, registered and licensed vocational nurses, and nursing assistants. Adding to the quality of our residents care is the support from the community. Volunteers, clergy, clubs and organizations, and individuals who spend time or share their talent with the residents and or fund projects, such as the Ewing Wing Garden, created and built by the Mariposa Rotary Club. If would like to place your loved one you would like us to consider for placement or be put on our waiting list, we ask that you complete our Family Admission Questionnaire. You may fax the completed questionnaire to 209-742-7568, attention Donna Nolen. For additional information please call Donna Nolen at 209-966-3631, ext. 5033.